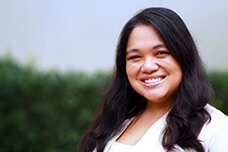 Kristel Dupaya is a Ph.D. student in the School of Education with a specialization in Learning, Teaching, Cognition, and Development (LTCD). She is interested in exploring the mechanisms behind students' pursuit of and persistence in STEM education. In particular, she is looking at the ways women and underrepresented minority students’ relationships impact their motivation to persist in STEM degrees and careers. Kristel grew up in the south suburbs of Chicago, Illinois. She moved to Massachusetts to earn her B.A. in Psychology and Chemistry at Wellesley College. While earning her undergraduate degree, she worked closely with the Wellesley Centers for Women on projects focusing on STEM education research and gender equity. After earning her degree, she moved back to the Midwest to work as a research assistant at the University of Chicago with the Cognitive Development and Human Performance Labs on projects focused on improving spatial learning and math proficiency. She is currently a member of the Discover Science Initiative (DSI) and Diverse Educational Community and Doctoral Experience (DECADE) at UCI.